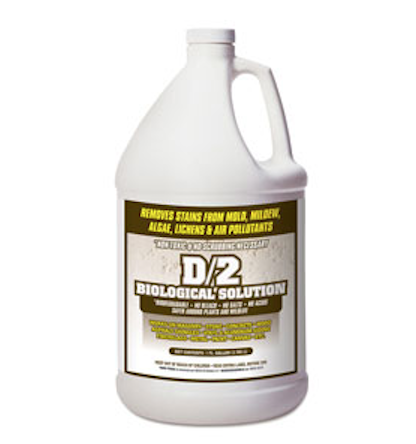 D/2 Biological Solution is a biodegradable, easy to use liquid stone cleaner that removes stains from mold, algae, mildew, lichens and air pollutants. It is effective on marble, granite, limestone, brownstone, travertine, masonry, terra cotta, concrete, stucco, wood, and other architectural surfaces including monuments, sculpture and headstones. A contact time of only 10 to 15 minutes followed by scrubbing with a soft nylon or natural bristle brush will loosen most biological and air pollutant staining. D/2 Biological Solution is non-mutagenic, and contains no carcinogenic compounds as defined by NTP, IARC, or OSHA. It is considered essentially non-toxic by swallowing, as it has an oral LD50 of 2.0 g/kg of body weight. No special ventilation is required during use. D/2 is a quaternary ammonium solution with surfactants to enhance cleaning capabilities. Notice: The information contained herein is based on our own research and the research of others, and it is provided solely as a service to help users. It is believed to be accurate to the best of our knowledge. However, no guarantee of its accuracy can be made, and it is not intended to serve as the basis for determining this product’s suitability in any particular situation. For this reason, purchasers are responsible to make their own tests and assume all risks associated with using this product.